In the mid-1990s, there was no bigger pop group in the world than the Backstreet Boys. The heartthrobs ruled the airwaves with their sappy ballads and smooth dance moves. Teenage girls swooned over them, as they earnestly sang ``Quit Playing Games With My Heart," and ``As Long As You Love Me." Like most boy bands, the Backstreet Boys had some problems transitioning from being cute teenage heartthrobs to mature adults. But the group has successfully moved on to a more pop-rock and R&B sound, as seen in their seventh album ``Unbreakable." Definitely no longer boys, the Backstreet Boys will show their mature side in concert, March 8 at the Olympic Fencing Gymnasium, Olympic Park. They are returning to Seoul after a successful concert in 2006. The Backstreet Boys are now composed of four members: Brian Littrell, Howie Dorough, A. J. McLean and Nick Carter. Kevin Richardson left the group in 2006. The group has been nominated for several Grammy Awards, and is considered the best selling boy band of all time with 100 million albums sold worldwide. Formed as a vocal and dance group in 1993, the Backstreet Boys began by promoting their first album in Europe and Asia to much success. In 1997, the group made their U.S. debut with the album ``Backstreet's Back." Their first single,``Quit Playing Games With My Heart," became an instant hit in the U.S. and Europe. The Backstreet Boys released another album,``Millennium," in 1999, selling over 40 million copies around the world. It included the number one hit ``I Want It That Way." The album was also nominated for five Grammy Awards, including Album of the Year. The following year, the group released ``Black and Blue," which included ``Shape of My Heart." In 2001, the Backstreet Boys released a greatest hits album,``The Hits: Chapter One." Then, the group took a break due to conflict with their management agency. Meanwhile, Carter released his solo album ``Now or Never." 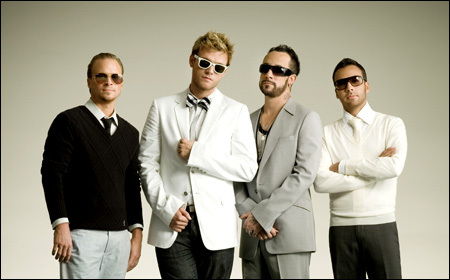 The Backstreet Boys made a comeback in 2005, with a new pop-rock album ``Never Gone." Songs such as ``Incomplete" and ``Just Want You to Know" showed how the members have matured. Their latest album ``Unbreakable," released October 2007, received generally good reviews from critics. To promote the album, the group is embarking on the ``Unbreakable" world tour next month, with several concert dates in Asia and Australia. Tickets for the Seoul concert will be available starting Jan. 29. The VIP tickets are 165,000. Other tickets range from 55,000 won to 132,000 won. Visit ticket.interpark.com.